Needless to say, I changed out of my costume and went to work without one that year. Children under the age of 4 can focus on only one aspect of the situation, and have difficulty seeing the “big picture.” It isn’t until much later, around age 7, that they begin to develop reason and logic, and even later, around 11, that they begin to understand abstract thinking. No wonder school-agers get so hyped up about Halloween! For very young children, Halloween can be a stressful holiday. If you’re celebrating in your center, consider what your goals are for children. Teachers and programs intend to provide a safe emotional environment for children, to offer them stability and avoid introducing stress into their lives. Piaget theorized that a very young child’s reasoning is static, that for them the world is an unchanging place. When change is introduced it is sudden and irreversible. When mommy turns into daddy, for example, a young child will have a very difficult time understanding that this isn’t a permanent change because she can’t focus on anything beyond the current moment. When we consider what Piaget has to say about a very young child’s ability to reason, does it really make any sense to celebrate Halloween with costumes? It is interesting to note that under the age of 3, most children do not remember holidays like Halloween unless they were traumatic or an adult tells them the story later in their childhood. So when it comes time to celebrate in your center, consider activities that children can understand. Have a special snack, paint a pumpkin or go outside and observe the changes in the season. But leave the costumes at home. 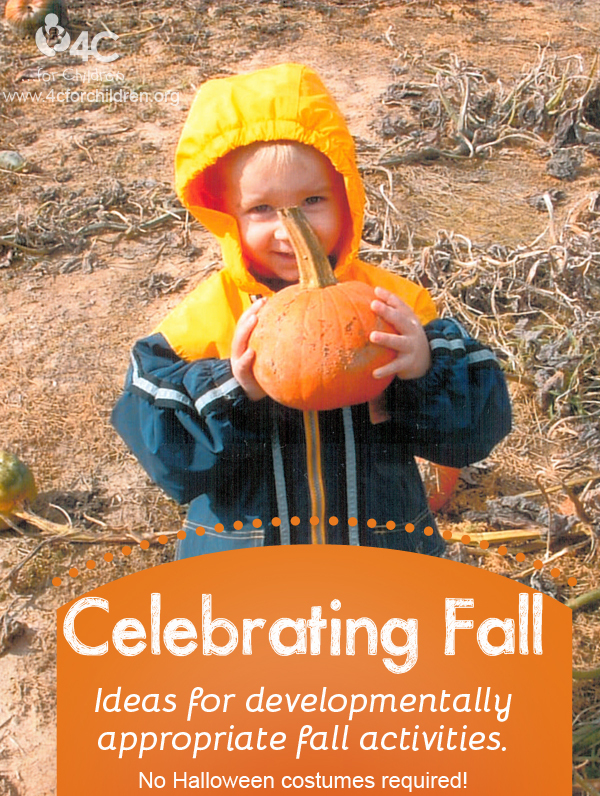 This entry was posted in Best Practice, Directors & Administrators, Early Childhood, Infants and Toddlers, Preschool, Professional Development and tagged brain development, children, early childhood, halloween, preschool, social and emotional development, teachers on October 11, 2011 by 4cforchildren. You make a good point–costumes that seem humorous or harmless to adults may still be terrifying to children! When I was around 4, my grandpa wore a gorilla costume for Halloween, which as an adult doesn’t seem scary at all. However, even though I watched him put the mask on and take it off several times, I just couldn’t grasp that it was still Grandpa and not a scary beast! Lucky for me, Grandpa decided (like you) to leave the mask off and just be Grandpa…making that Halloween party much more enjoyable for me at the time!